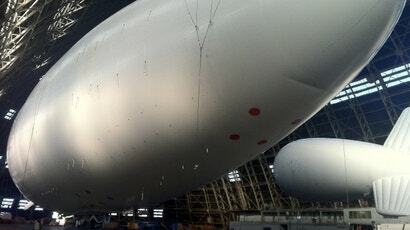 Upstart Virginia aerospace firm Mav6 is offering to install guided missiles on the massive, robotic spy blimp it's building for the Air Force. The idea would only be slightly terrifying, if the massive airship was headed to Afghanistan, as originally planned. But Mav6 and its CEO, a respected retired Air Force general, are also promoting the giant airship for homeland security missions over US soil. In that way, today's war blimp could become tomorrow's all-seeing, lethal Big Brother. Capable of hovering at 20,000 feet (6096m) for a week at a time while carrying radars, cameras, radio links and computer processors — the "most powerful" of their type in existence — the Blue Devil 2 airship can also be fitted with "weapons modules," according to marketing material provided by Mav6. The brochure [PPT] depicts a rotary launcher fitted with 45kg Hellfire missiles, capable of hitting pinpoint targets up to 8km away. The launcher would presumably dangle from the tractor-trailer-size gondola that also houses the sensors, radios and computers. As originally configured, Blue Devil 2 would need help from armed drones or manned jet fighters to attack any targets it finds. With missiles installed, the 160km/h airship would theoretically be able to spot and kill bad guys all on its own. What Mav6 calls "semi-automated sensor-to-sensor cueing for enhanced threat detection" should minimise human intervention. Controllers on the ground would provide the basic flight plan, occasionally point the sensors and give permission to fire. Originally, the company believed those missions would be carried out overseas. But Mav6, founded by former Blackwater employees, is anticipating growing demand from other government organisations. "There are endless examples of non-military, commercial applications for airships," a company spokesman says. The marketing brochure also lists "law enforcement", "crowd control", "pipeline monitoring" and "border patrol" as possible missions. Adding missiles to a previously unarmed support and surveillance craft is not unheard of. Right before 9/11 the CIA and Pentagon installed Hellfires on its Predator spy drones in hopes of taking out Al Qaeda operatives in Afghanistan. Today Predators and their larger Reaper cousins routinely carry missiles and bombs. The Air Force and Marines have added small precision missiles to some of their C-130 transport planes. During World War II Navy airships carried depth charges for sinking German submarines. Granted, it's unlikely you'll wake up someday to discover missile-armed Blue Devils hovering over your house — at least not anytime soon. At present, the US Air Force is the only customer for the Blue Devil 2. And even they are having second thoughts, despite the fact that former Air Force intelligence chief David Deptula is Mav6′s chief executive. Just a year after dropping $US86 million for the design and construction of the 113m long Blue Devil 2 prototype, the Air Force lost confidence in Mav6′s ability to handle the project. The flying branch said it would "de-scope" the program, omitting the sensors entirely and cancelling a planned test deployment to Afghanistan. But Mav6 is confident the giant airship will hover back into the military's good graces. "Airships will prove to be an invaluable and effective tool for all branches of military," a company spokesperson tells Danger Room. Mav6 has its share of boosters. In February, US Senators Thad Cochran and Daniel Ionuye wrote to the Pentagon urging the continued development of Blue Devil 2. But even if the Air Force gives up entirely on the airship, its days may not be over. The migration of military drones into homeland security has happened before. Border Patrol flies the same Reaper drones as the Air Force, though the Border Patrol ‘bots are currently unarmed. Even so, the use of military-style drones for US law enforcement has raised fear among civil libertarians. Imagine the reaction to a potentially armed Blue Devil 2 looming over an American community. The pathways are clear for giant missile blimps to float off the drawing board into the war-zone and subsequently into US airspace. That doesn't mean it will happen soon, or at all. But it certainly could. And probably shouldn't.